One year after launch from Kourou, French Guiana, the Rosetta probe will be just 2,000 km from Earth at the end of this week. So long to cover such a short distance? In fact, the probe is returning to our neighbourhood, having already completed one orbital revolution of the Sun. This first flyby close to Earth will boost Rosetta’s chase toward its target comet Churyumov-Gerasimenko. One year after setting out on its interplanetary voyage, Rosetta is in perfect shape. Following the launch from Kourou on 2 March 2004, it has undergone several phases of tests to check out the health of the spacecraft and the Philae lander. All spacecraft systems—power, attitude control, thermal control, Earth communications, data recording and flight software—have been checked out, starting with the most critical. The micro-cameras on the CIVA instrument are working well, as shown by this picture taken of Rosetta’s solar panels. Besides a failed pressure sensor on Philae, test results have shown that payload experiments are operating as intended and in some cases even exceeding performance expectations. Above all, they have successfully demonstrated their compatibility—a crucial factor once the instruments are activated in the vicinity of Rosetta’s target comet. Health checks on the spacecraft are performed every 6 months. The instruments will begin acquiring real science data during planetary and asteroid flybys. 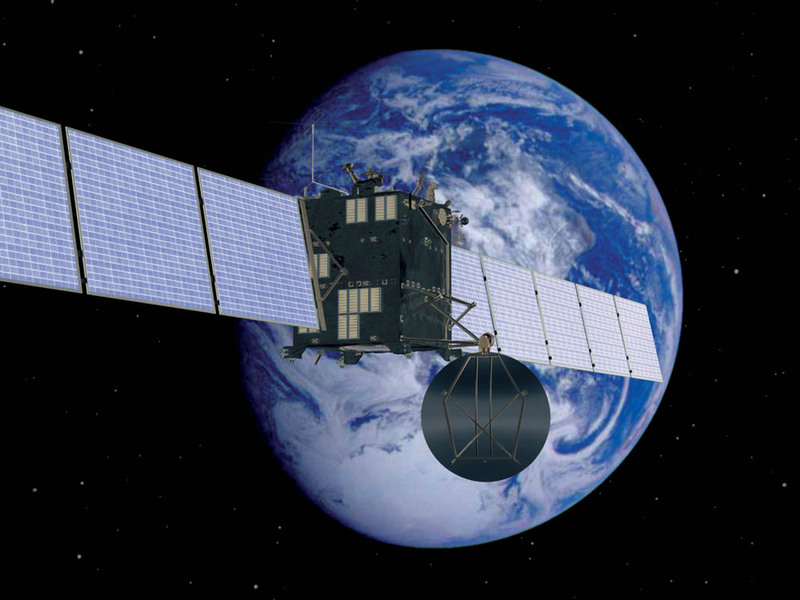 On 4 March, Rosetta will make its first flyby of Earth, passing at a distance of just 1,980 km. This will be the first in a series of gravity assist manoeuvres to boost the probe’s orbital velocity and adjust its trajectory before departing on another revolution around the Sun. The flyby also has a science objective, since Rosetta will look for the boundary of Earth’s magnetosphere and acquire calibration images of the Earth and Moon. Later this year, on 4 July, the U.S. Deep Impact spacecraft will send a 300-kg impactor crashing into the surface of comet Tempel 1. Scientists are counting on Rosetta to observe this event. Rosetta will perform a total of 4 flybys before reaching its final destination, comet Churyumov-Gerasimenko, in 2014. Between now and 2009, it will fly by Earth twice more and Mars once. Before commencing its main mission to characterize the comet nucleus, it will also study 2 large asteroids, Steins and Lutetia, chosen for their size and scientific value.